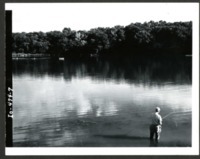 Man casts fishing line into water in Cass County, IA. Lee Johnson farm, Cass County. C.W. Hancock, Cass County. Views of the gully before and during construction. The excavation is for the pipe spillway, which had a total fall in it of 9 feet. C.W. Hancock, Cass County. Views show centerline of pipe spillway before and during construction. About 8 feet of excavation was necessary at the upper end by the riser. C.W. Hancock, Cass County. Views of the gully before construction of the structure. Ed Amador, Cass County. Drop inlet on road culvert to be raised to provide better gully control. Adolf Pettinger, Cass County. Looking downstream. 3:1 slopes secured, fill was seeded and mulched. Adolf Pettinger, Cass County. Ada - 32 acres, 21 inch pipe spillway with 30 inch riser. 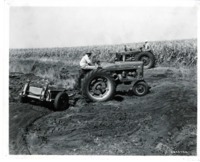 Tractors work to shape the Cass County farmland. 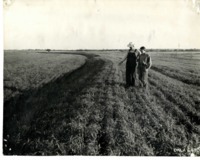 Men examining a field in Cass County, Iowa.